Russ has returned to writing and performing after what he thought was a career ending operation on his vocal chords. His background is in folk, blues and rock. He had his songs charted in Canada and in one case had a #1 chart topper in Quebec on French pop music radio co-written and performed by Renee Martel. He had toured in the US, had a publishing deal with MCA Music Publishing in New York, and performed continually in groups and as a solo artist in Canada based first in Montreal and then in Halfax, NS. This first period of his music life lasted for 25 years before he lost his voice. Describing himself as an extraordinarily fortunate person, He found a new life with the funding of the arts in Canada. He worked first as a program officer for the Canada Council for the Arts for five years. Then he was the founding Executive Director of the first Nova Scotia Arts Council, followed by being appointed to the newly created position of Acting Executive Director of Culture for the Province of Nova Scotia. Subsequently, he was appointed to the position of Head of Music for the Canada Council for the Arts, the national arts funding body. He remained in the position of Head of Music for ten years, during which, midway through he began to write and sing again. Slowly but surely much of his voice returned. It is different than before, not the same range, but it has become an interesting voice, rough and expressive, that together with his fine guitar work has audiences responding very well. In the summer of 2012, he began performing seriously again, appearing first at the Stan Rogers Folk Festival in Canso, Nova Scotia followed by the Mariposa Folk Festival in Ontario. He then spent the last two weeks of September and early October on a 12 date tour of house concerts in Manitoba organized by Home Routes in Canada. Since then he has performed at various gigs, festivals, and many house concerts across Canada. His first solo CD has been released in Toronto in early January, 2013. 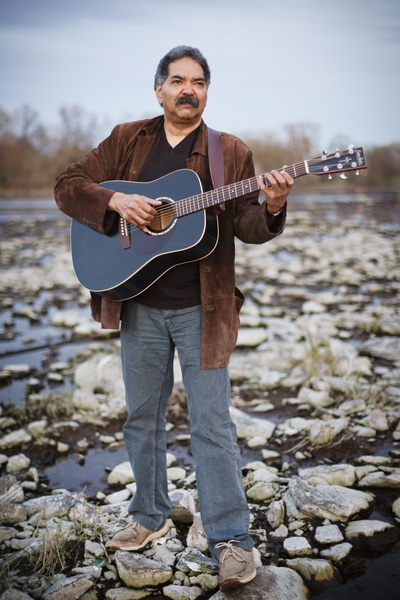 “Crazy Shades of Blue” consists of ten original songs recorded on Lake Winnipeg with some of Winnipeg’s finest musicians and sweetened by guest artists such as Juno Award winning Jane Bunnett and slide guitar master Doug Cox. Russ continues to write and to perform across Canada and plans to release his second CD of original songs ‘In Plain Sight” on May 6, 2015 at Irene’s Pub in Ottawa, followed by release shows in Toronto and in Quebec.